After a home break in resulting in the loss of priceless memories, Matthew set out on a home protection journey. Years later the products he implemented were put to the test – did they work? Find out now. Five years ago, I experienced a rather stressful home burglary in which my wife and two small children came home to a kicked-in back door and a ransacked house. We lost a television and our two laptop computers (one of which contained the only video of my first child’s first steps). Insurance, of course, covered the losses of property, but nothing could cover the feeling of violation and replace the lost memories. I conversed with neighbors who all shared the same sets of advice: Get a gun, get a dog, get a security alarm, put up alarm company signs, put up security cameras. However, further discussion with my neighbors revealed that none of these things were foolproof: There were cases where the alarms didn’t serve as a deterrent, cases in which dogs barked throughout the entire burglary as the bad guys went about their business, and cases in which the security cameras yielded nothing more than a few seconds of grainy camera footage of a burglary in progress. 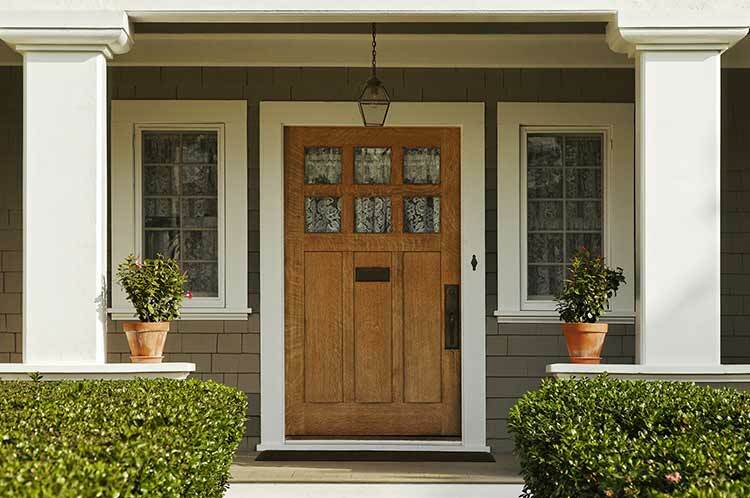 Most doors only have a flimsy piece of hastily-installed pine protecting you from break ins. In Matthew’s case, this piece failed, and the burglar gained entry through his door. 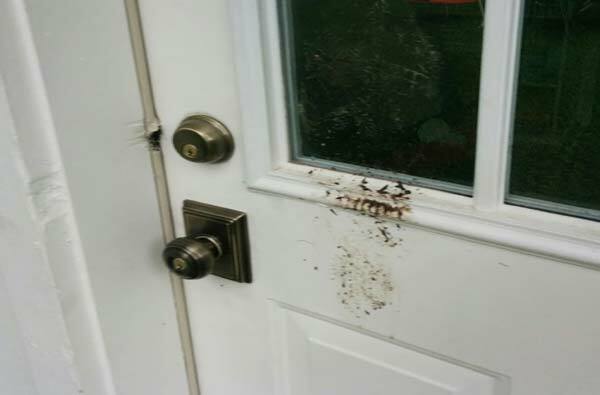 All in all, I was rather dismayed, but I noticed, a theme emerging over and over in my discussions: Nearly every burglary victim I talked to mentioned a back door that had been kicked in. I realized that nearly all measures that were presumed to increase security were effectively worthless as long as it took a few seconds to kick in a back door. A flimsy piece of hastily-installed pine was all that was keeping the bad guys out, and was the textbook definition of the ‘weakest link’ in the security of the home. So, I began my search to find a means to prevent a back-door kick-in, and came across the DoorGuard, an elegant, clean, inexpensive and simple solution to a problem that has plagued homeowners for decades. 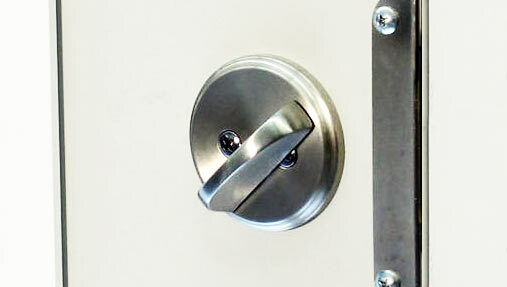 I installed DoorGuards on all of my doors, and had 5 trouble-free years after that. I began my search to find a means to prevent a back-door kick-in, and came across the DoorGuard, an elegant, clean, inexpensive and simple solution to a problem that has plagued homeowners for decades. When we moved to a new neighborhood, the first thing I did was install DoorGuards, ANSI grade I deadbolts, and and PSE’s L-shaped Escutcheon plates on all 5 of my doors. I made a second pass of installing hurricane-proof laminate on all windows in and around the secured doors. My new neighbors thought it strange that I wouldn’t buy a dog, hire an alarm company, or put up security cameras – I explained the DoorGuard to them, but their contention was that something so small (and technologically simple) couldn’t possibly deter crooks. A few weeks after moving in, I came home from dropping my kids off at school, and saw 3 police cars investigating a burglary further down my block. Out of curiosity, I walked behind my house, and discovered that someone had attempted to crowbar his way into my utility room (and had been thwarted by the DoorGuard). He then attempted to crowbar open two of my windows (which had been locked and painted shut since the 1960’s), and then attempted to kick-in and crowbar my back door (no go, due to the DoorGuard). From the looks of things, the back door had withstood at least 4 strong kicks, and a half-dozen crowbar attempts. The back door had withstood at least 4 strong kicks and a half-dozen crowbar attempts yet, thanks to the DoorGuard, did not give way. The cops came to visit after they finished investigating the burglary up the block, and were dumbfounded: “Did your dog scare him off? No dog. Did your alarm scare him off? No alarm” I explained the DoorGuard to them, and they were impressed with the simplicity and effectiveness of it. One even asked me to come speak to his department about this little piece of hardware. From the sequence of events, the burglar attacked my place, spent quite a while trying to get in, grew frustrated, and went 3 doors down, and successfully broke into and looted a house while the burglar alarm screamed. Security camera footage on the block showed that the suspect was about 6’2 and weighed between 250 and 275 pounds. The DoorGuard works, does its job beautifully, and kept a mountain of a man out of my house. For a few hundred dollars, the DoorGuard prevented an attempted burglary from becoming a successful burglary, and bought me (and my family) an untold peace of mind. All I had to do to recover is apply a bit of touch-up paint over the crowbar scratches. Ron Olberding and the folks at Physical Home Defense should be commended for a brilliant product, it is clean, simple, elegant, inexpensive, and stunningly effective!